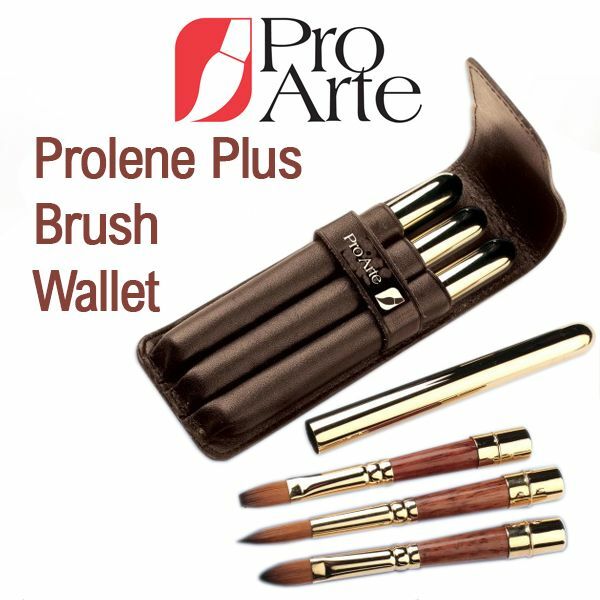 The Pro Arte Series RBW Brush Set contians a round (approximately size 10), flat (1/4") and filbert (approximately size 6) retractable brush in an attrcative pocket-sized leather wallet. The Pro Arte Series RBW Brush Set contians a round (approximately size 10), flat (1/4") and filbert (approximately size 6) retractable brush in an attrcative pocket-sized leather wallet. Each brush combines a wide variety of Prolene Plus (the flagship of the Prolene brush collection) synthetic filaments with a gold plate ferrule and teak upper handle. Ideal for use with Gouache and watercolour, Prolene has the appearance of fine quality sable hair and actually reproduces some of the characteristics for which sable has become renowned; it has a similar degree of spring to that of sable and possesses the same fine pointing qualities with the ability to withstand the rigours of wear and tear.